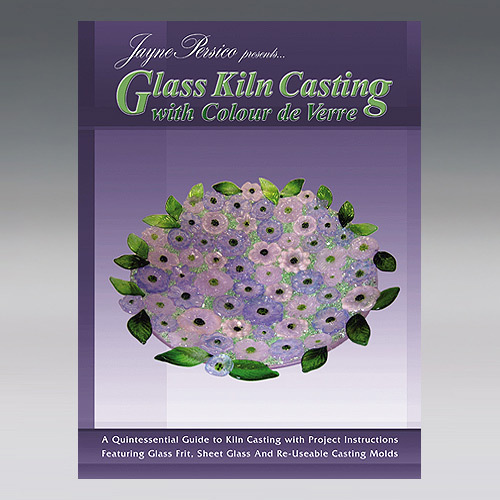 Glass Kiln Casting instructional book. Jayne Persico brings her fresh and timeless style to the art of Glass Kiln Casting. This inspirational yet thoroughly practical guide presents lush photographs of beautifully finished pieces that will capture the imagination. The clear and simple instructions will enable fusers of any skill level to achieve amazing 3-dimensional creations. Glass Kiln Casting is an 80-page book offering more than 260 color photographs in 12 chapters that will inspire dozens of exceptional projects. The opening chapter features invaluable information covering frit casting molds, tools, equipment and kilns, plus an in-depth yet simple approach to working with digital kiln controllers. This book is sure to become a studio favorite that fusers of all levels will refer to time and again. Jayne's take-you-by-the-hand writing style guides crafters through the frit casting process. She'll show you how to make frit cast jewelry, plates and bowls with amazing results that will impress everyone who views your creations.